Turns out turkeys don’t fly. The Baxter Bulletin reports that attendees at the Turkey Trot festival in Yellville were disappointed when no turkeys dropped from planes on October 7th and 8th. The turkey drop is a mainstay of the event in northern Arkansas, though organizers don’t sanction it. Supporters say the turkeys can fly just enough to descend safely, but animal-rights advocates call it cruel. The People for the Ethical Treatment of Animals posted a $5,000 bounty for information leading to an arrest. 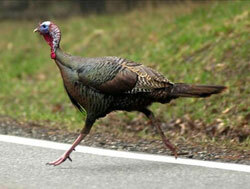 The Federal Aviation Administration said any pilots dropping turkeys could lose their licenses. People at the festival wore “I am the Phantom Pilot” T-shirts, and at least one sign offered a $10,000 reward for the arrest of the PETA employee who came up with the $5,000 bounty. LONDON — Rob Sloan boasted he’d completed an “unbelievably tough” marathon near Newcastle after crossing the finish line in third place with a personal-best time. Apparently, he didn’t count the bus ride. Sloan will go before a district committee this month and faces the possibility of being banned from marathons. One of the most famous cases of cheating in a marathon came at the Boston Marathon in 1980. Rosie Ruiz was the first woman to cross the finish line but was disqualified when officials discovered she jumped into the race about a mile from the end. A Japanese company has developed a way to make face masks of any person that are accurate right down to each hair and pore. The masks, called 3-Dimensional Photo Forms, are manufactured by REAL-f. They sell for $3,920 for a face mask, and $5,800 for a mask of a person’s full head. Gee, for that much money, you’d better get a lot of candy. VEVEY, Switzerland — Nestlé, the world’s biggest food company, is seeking to conquer the dog-food market with special advertising targeted at man’s best friend, the firm said yesterday. “Nestlé Purina has created the first-ever television commercial especially for dogs,” it said in a statement.